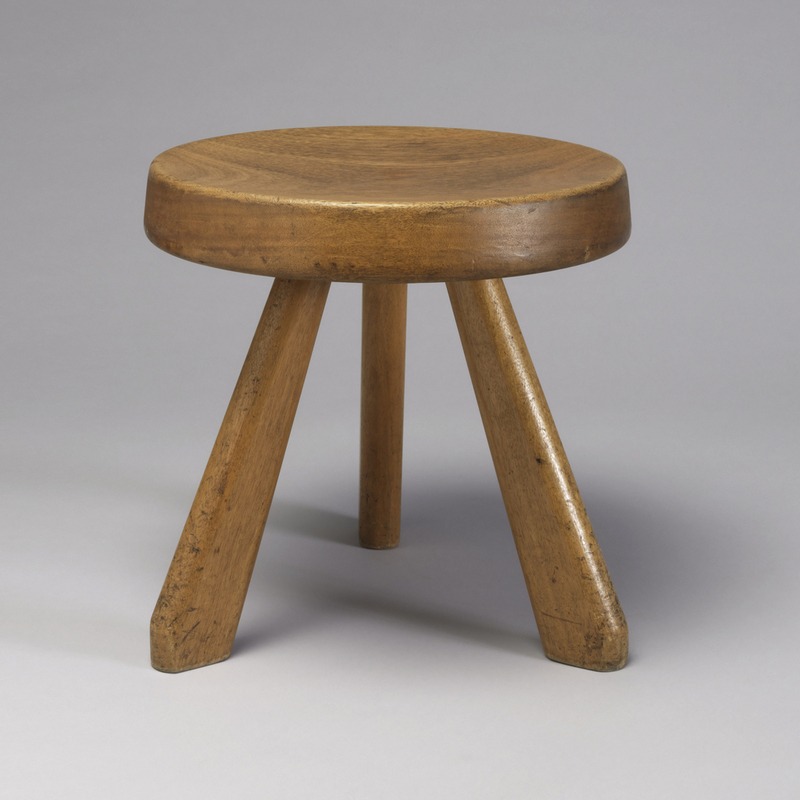 In a 1929 article for The Studio, Charlotte Perriand, the designer of this stool, wrote polemically about the advantages of using metal over wood, noting its utilitarian and aesthetic value. She said, “Metal plays the same part in furniture as cement has done in architecture. It is a Revolution.” Her now-iconic B306 chaise longue made with tubular steel, created in collaboration with Le Corbusier and Pierre Jeanerette, reflects this perspective. Only a few years later, though, she would change her stance on the value of metal versus wood. In the mid-1930s, after a sojourn in Japan, much of her furniture can be characterized by the use of organic materials—a stark contrast to her earlier modernist furniture. In a 1984 interview, looking back on her career and use of materials, she noted, “I learnt that there are no unusable materials; what matters is how they are used.” She went on to explain how her preference for wood evolved after noticing the beauty in artisanal craftsmanship—a quality that no factory could reproduce. This stool created for Les Arcs, a ski resort in France, is a prime example of her later work. Perriand worked with various woods, but her preferred variety was pine (which this stool employs). Though modernist in its lack of ornamentation and simple forms, the use of wood imbues the stool with a sense of vitality and warmth. The material as well as the low profile simultaneously bring to mind rustic furniture such as milking stools as well as Japanese stool forms. These may have been sources of inspiration for her design. Perriand designed an entire range of furniture similar to this stool for Les Arcs in the mid-1960s and throughout the 1970s. These objects furnished the rooms at Les Arcs and could be commercially purchased as well. Photographs of the living rooms show that stools such as this one were accompanied by wooden tables and chairs. Her work for Les Arcs extended beyond furniture design; Roger Godino, the initiator of the project, recruited Perriand to work on other elements of the resort’s design such as the site planning and the room layouts. In all aspects of her work at Les Arcs, her minimalist aesthetic paired with a keen attention to utility corresponded to the spatial and financial constraints of the project. Though Perriand is often remembered for her early designs in metal, this stool demonstrates her propensity for clean and functional design, regardless of material. Charlotte Perriand, “Wood or Metal?,” The Studio, vol. 97, 1929. Charlotte Ellis and Martin Meade, “Interview with Charlotte Perriand,” Architectural Review, November 1984.